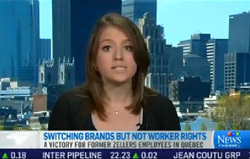 Click on the image above to watch the CTV interview that explains how important this decision is for Zellers-Target locations and retail workers in Quebec. Montreal – June 28, 2013 – Canada’s leading voice for retail workers, the United Food and Commercial Workers (UFCW Canada), joins Zellers workers in Quebec today in celebrating a decision by the Quebec Labour Standards Commission that recognizes – for the first time – Target’s responsibility to Zellers workers and their communities by ruling that Target needs just cause to deny former-Zellers workers employment in the rebranded retail locations. During an interview with reporter Marie-Pier Duplessis (as published in Le Soleil on June 28, 2013), the spokesperson for the Labour Standards Commission, Jean-François Pelchat announced that all former Zellers employees who had applied for a job at Target, and whose application was turned down, had 45 days from the date of the denial notice to file a complaint with the Commission for dismissal without just causeunder sections96 and 97 of the Act. As far as UFCW Canada is concerned, the Commission’s decision clearly recognizes the employment relationship between former Zellers employees and their new employer – Target. “It's an important day for Zellers employees. At last, their labour rights are being recognized and Target will have no choice but to respect them. We encourage all the men and women who suffered another setback from Target to file a complaint with the Labour Standards Commission. The more employees who file a complaint, the clearer the message will be that the company is not above the law and that it cannot use unethical ploys with impunity. Even if these workers are not union members, UFCW will support them all along the process,” says Antonio Filato, president of UFCW Canada Local 500.